Never say never or it’s impossible . Only fools say such things. There is a lot of talk about Google supplemental results and the supplemental index; the general feeling and awareness when your pages are tagged as: Supplemental Results you don’t stand a chance of ranking in the Search Engine Results Pages of Google. I too was very skeptical … until today. In fact I have searched the Google index many times to identify pages that were labeled as supplemental and find them ranking at some position – definitely not on the first of the SERPs. Today I ran a check on my site for supplementals – you can run the check by using the query: site:www.your-domain-name.com *** -sljktf I noticed a particular page that was supplemental but I was sure had been picked up by Google (hittail.com is a great for this kind of real time monitoring). 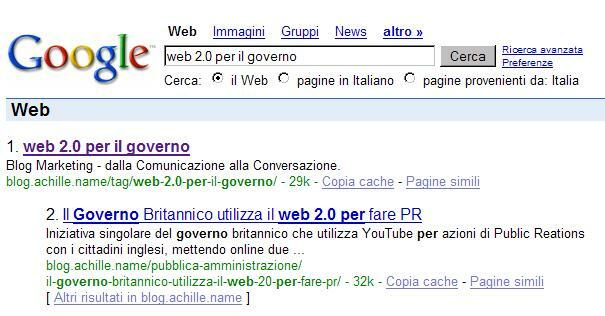 The query was: web 2.0 per il governo (= web 2.0 for the government) There is a fair amount of competition for this query (over 1,2 million pages). The web 2.0 section of the blog ranking #3 had been last updated in march 2007 – the blog hasn’t been updated since April of this year. There are many incoming links, but most of them point to the website home page: Only a handful point to the blog – so the Blog Page Rank is coming from the home page and not from external links. supplemental index pages of a trusted site are likely to rank regardless of their presence in the supplemental index, if the site is viewed as the most authoritative and trusted for that specific query. Do you agree ? Have you had any experience with pages in the supplemental index achieving top rankings with Google ? yes, you are right. sometimes it happens. this is why i quit looking for supplemental results. I don’t understand Google at all. My pages go in and out of supplemental. My traffic increases via Google keyword search, but my PR rank drops. Sometimes my Google keyword search jumps and drops dramatically. I increase link backs to my site, but my PR went from a 4 to a 3. So go figure. I’ve stopped looking at Google PR and Google supplemental results. I can’t figure it out. It’s up to the Google god! To a newbie like, this just gets too confusing. Perhaps, later I can have the nerve to figure this out, but for now… well, I’m letting fate do its job. I’ve had supplemental pages rise up into the high ranks before. Time is an important contributor to this though. The older the page, the better chance it has I’ve found.